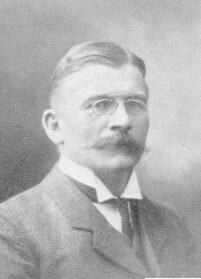 Rudolf Recknagel was educated at Heidelberg and Freiberg, Germany, and became a member of the (British) Institution of Mining and Metallurgy and of the American Institute of Mining Engineers. In 1893 he married Grace Johnston, with whom he had one son. He practised as a mining engineer in New Zealand, North America, Siberia, Thailand, Ghana, Sierra Leone, and New Guinea, before coming to South Africa in 1903, where he became consulting engineer to the Oceana Company and others in Johannesburg. In 1904 Recknagel became a member of the Geological Society of South Africa. During 1909 he contributed two papers on the tin deposits of the Bushveld Complex in the central Transvaal to the society's Transactions: "On some mineral deposits in the Rooiberg District" (Vol. 12, pp. 83-106) and "On the origin of he South African tin deposits" (Vol. 12, pp. 168-202). He was still in South Africa in 1913, for during that year he participated in the discussion of a paper by D.P. McDonald* on the mineralogy of the Rooiberg tin ores. By the end of 1914 he resided in London, but was still a member of the Geological Society of South Africa.